The saga of Princess Ariadne continues! Prince Theseus has been captured by cruel Amazons and it’s up to you to help Ariadne on her dangerous and exciting journey to save her beloved. Play various Match 3 levels with unique mechanics, search for special hidden objects to restore a temple and receive power-ups from the Gods! Explore the game in Adventure mode, or play the Loom mode for a more traditional Match 3 game and unlock art and wallpapers in Trial of the Gods 2! Trial of the Gods: Ariadne’s Journey is rated 4.4 out of 5 by 13. Rated 5 out of 5 by melissa845 from Lots of different ways to play Match-3 Finally, a feminine heroine in the Match 3 Hero themes category. Sure she has sparkly eyes but the game features lots of different ways to play match-3 and to test or hone your skills It is not a boring game. The HO's are easy and one is given a lot of hints to get through them if HO's are not your thing. A great game with enough challenge to make it interesting. Rated 5 out of 5 by bessiegirl from Good match 3 change The developers are certainly coming up with new ways to make match 3 games interesting, creative and challenging. Totally enjoyed this game even thought the character graphics in the dialog were obviously designed by a team of men! LOL Unique match 3 which can certainly be a challenge at times especially the golden trail which had me confused for awhile. Probably because I'm horrible at taking the time to read instructions. Certainly a longish game and I feel I got my money's worth. Choice of relaxed or timed and two different kind of adventures if you complete the one. Rated 5 out of 5 by WiccanWoman530 from 2nd in Series, love this M3! CE type extras, story and BIG replay value! What's not to love?!! LOL I LOVE them! More More More.. Pretty pleaaaaaasssseeeeee??!!! :P This is a M3/HOG, Very few HOG scenes, one per Chapter, with 10 or so items. If you like both M3 and HOGs it's a nice add on, (HOGs+RPGs are my 1st loves, then I tried M3s like this and Builder's, so I love Combo games!# if you don't like HOGs, the good news is; They are only a tiny part of the game and pretty easy! It's the kind that seems like new after awhile and you'll go back to play over and over with 2 play modes! I keep it on my portable at all times, when I'm bored in Dr's or long trip/bus ride. The length is as far as I got #forgot to finish it until now, after a OS reinstall# is good, a few days if your not a speed demon like me. There is about 60 Chapter's on the Map, but if I recall correctly, there was other Maps beyond the main one, in the 1st game..so there may be more Chapters/Maps in this one too. Sure you could try to zoom through, play timed... but it feels more like a game you slowly enjoy the ride and never want it to end! The options alone in this game make it amazing! The highlights: 1. Most important.. YES this has TIMED AND UNTIMED OPTIONS!! TY Developers!! 2. It fit's both my older and new laptop screen. On my new one, I just had to adjust the settings.. #I know.. BUT it IS possible!!) and only took me a few seconds to change back/forth. For some games it's worth it, this one is! 3.Both Music and Sound can be adjusted, I kept the sound on medium and like the satisfying sounds of matches/game actions. 4.YES, there is a story! It's played out in several beautiful hand drawn scenes at the end of every chapter, and messages in levels from those Adriane meets along her Journey; including the Gods/Goddesses whose Temples you must rebuild along the way 5. 2 Different Modes: Adventure, which is the story Mode, and must play to unlock Wallpapers. 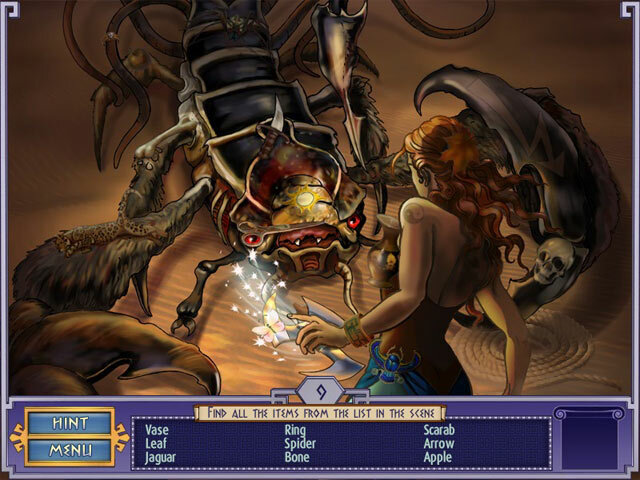 Ariadne’s Loom, where you play 10 levels to "weave" each Tapestry. The latter being one of the things I loved, the timer in it goes up and offers a HUGE replayability Factor..this is a M3, you'll want to play more and can't get enough of!! You unlock more as you finish them. 6 Wallpapers. You must finish the Adventure to unlock them. 7 There are also "achievements" to earn for Trophy's. Adding more to Replayability, if you don't earn them the 1st time 8 As was in the 1st you are (Along with saving your man, LOL) "rebuilding" each Goddess's Temple. Wish it was my choice, as it is, you earn a peice of each per level. At the end of the Chapter (or in between levels.. you can chose that) you take the pieces you've earned on each level and place them where they go..there is a shadow area indicating this too, again very liner, but a few times I had to really look for where to put some of the patterned or smaller Temple pieces. Game Play and comments/thoughts: Standard "swap" M3, but with ability to make combos as big as you can imagine. Each level has different goals, Adventure ( Classic story mode) has pearls on certian tiles you must match to collect. Do not let the begining fool you, the levels do get harder, and you will run into things like items to get to the bottem areas, where you must get them to a space or more over to the right or left, clear the board. Typical locked tiles, the power ups differ and are added as you go alone the way (don't want to spoil too much! :) Tiles are clear, and easy on the eyes, as is the background for clearing the board when needed (you always can, some goals just don't require it) with some very light HOG scenes here and there. The HOGSs are well drawn, clear, some items cleaverly hidden, and all in the period of time... no cell phones or "Modern" Items give it a real feel, and each HOG scene, ties into the story. Love that, wish more Devs would've done/do so too! Cursor works fine, doesn't feel clunky or slow. The extra "Tapestry" levels, I just adore! More next time please!! In them, a cloth is woven into an animated picture over 10 levels or so each. Playing it tonight, I challanged myself to clear a whole board in one click, and did so stratagizing for 2 hours! The timer on it goes up. AND.. this is the only M3 I've played, that the longer you play and earn more "jewels" the more your points go up, instead of the other way around, where you have to rush to get a high score. GREAT IDEA LOVE THAT. The Jewels BTW are the power ups in it too. They are different for bigger/types/faster matches and thay can make awesome chains!! You can move them, or double click to set one off where it is (they are on the space where you moved the tile to). You can rush is you like, challage yourself many ways, or compete with a friend/spouse etc (time finished, points, see who can earn a Tapesry 1st etc.. in that mode, the only limitation is your imagination. Each Tapestry is a beautiful wallpaper. Normally I don't get excited, but I did. Part because I earned it, part because they are so well done. Summery: I LOVED the 1st. just finished when the 2nd was released (HELLO Orneon, we need more of this Series!!) I'd almost finished this one, when I had some tech troubles (my laptop not the game, it runs smoooth as silk on all my PCs!) Forgot to reinstall this game to continue the story, (the 2nd in the series) when I saw it on sale, I was happy for the reminder and got lost in it for 4 hours! Since it's and on the Dev's sale today it's a steal!! Try if you must, but I found it to be a very fun, relaxing M3, that is as challaging as you wish to make it. I wish we had more like it that have an Untimed option!! So I highly reccommend it! Buy it on todays Dev Sale, as a DD, use a credit or PCC.. just get it!! You won't regret it if your a M3/HOG/Adventure fan. and if you like greek/Roman themed games! Happy Gaming!! Rated 5 out of 5 by jil1 from Fun and pretty M3 This is a game to play several times. I already did it. Visual and graphics are simple but pretty. The storyline is easy to follow but interesting. There is a nice variety in the minigames that makes them interesting. Surely I recommend this game. Rated 5 out of 5 by Redbird616 from For Young & Old Alike This is a really neat game and would be great for kids. It's a mixture of match 3, hidden object and rebuilding. I thought I would get it for my grandaughter but found myself playing it and really enjoying it!! It's not really difficult which makes it a good game to just relax and play--the graphics are nice and the music isn't overwhelming like some of the games, just kind of soothing. Give the hour a try and see for yourself. Rated 5 out of 5 by kathiebee from Match 3 Fun I have been gradually becoming addicted to M3 games, and I just love this one. It has a twist on the M3 section of the games, with different elements added in so there is a variation. I love the HOG as well, as this also adds in a variation. And of course, I always love the bits where I get to build something. Some levels easy, some a little more difficult, but not impossible. I wasn't going to buy it until I saw it in the "games you will love" section, so I decided to try it. Now I'm glad I did. One more added to my Favourites in M3. Rated 5 out of 5 by RobbyLeslieDoll from FUN BEAUTIFUL THRILLING GAME Love the Graphics Colors & Fun Match 3 GamePlay The StoryLine is Clear & Easy to Follow & is easy to Make Sense of Hidden Object Mini Games are Fun as Well. Working With Buildings & Other Challenges that are Similar is Very Enjoyable & Addictive!! Tons of Fun !! Rated 4 out of 5 by pennmom36 from ADDICTIVE GEM MATCH 3 I came across this Match 3 game by accident, and it turned out to be a decent Match 3 game. After playing the demo, I realized that this is the second game of a sequel, the first one is, Trial of the Gods: Ariadne's Fate. I haven't played the first one yet, but it didn't receive very good ratings, so I'm not super eager to check that one out. You can play two different modes, Ariadne's Adventure, which follows a storyline and can be played in a Timed or Untimed mode. Level goals are shown at the bottom, and when the level goals have been completed, you receive a new item to restore the goddess's temple. 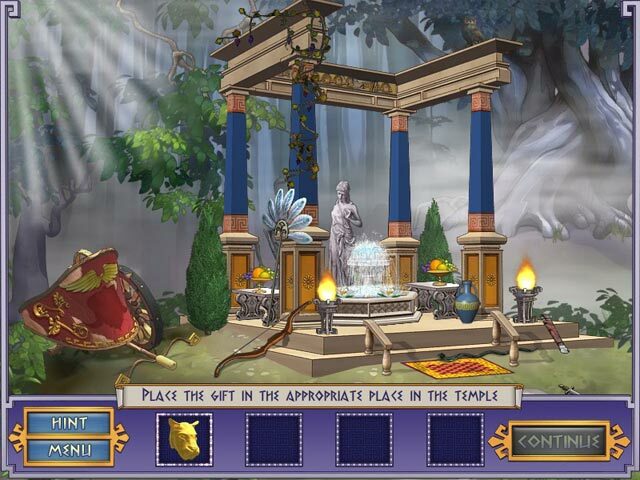 You must figure out where to place the items in the temple, (highlighted) When several items have been placed, you will earn an Artifact to help you progress. In Ariadne's Loom, your goal is to move the spool of thread down to the bottom of the board. The spools will eventually weave the tapestry, and the game has no time limits to accomplish the goals. When you make large matches, you will earn Bonuses on the board. 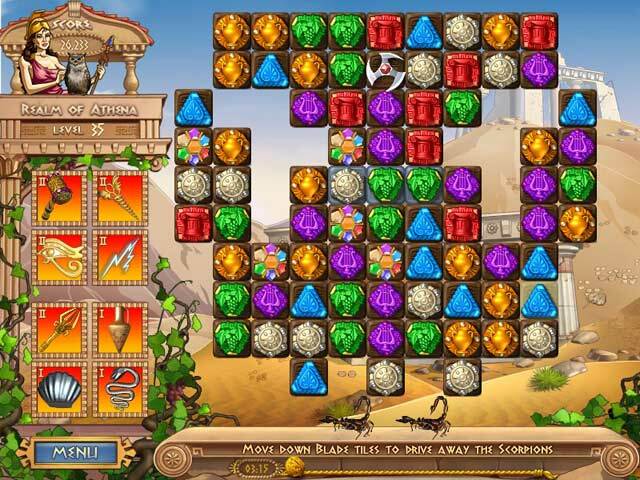 A match 4 earns you an Emerald gem which removes all tiles in a horizontal line. A match 5 earns you an Onyx gem which removes all tiles in a vertical row. Making two matches within one move earns you a Topaz gem, which will remove all tiles in a diagonal line. Making consecutive matches quickly will earn you either a Quartz gem that removes all tiles of the same color matched, a Purple Celestial Sphere that removes a small group of adjacent tiles, or a Brown Celestial Sphere that removes a large group of adjacent tiles, when you collect Coins with a single click before they disappear. Magic Artifacts given to you by the gods, such as a Hammer to remove any vertical line of tiles you choose, or a Caduceus' which shuffles all the tiles, can be recharged by making matches over all brown cells. There are Obstacles such as Purses of gems, that require a match of whichever gem is shown on the purse, or a power-up to remove, or Grids that must either be dropped off of the board, or destroyed with a power-up. The grid allows you to make matches with the gems inside, but the grid will remain on the board until destroyed or dropped off. The purses cannot be moved even if you are swapping with a different useable tile, until it is matched with 2 others of the same gem as shown inside the purse. There are also Hidden Object Scenes to break up the monotony, and I enjoyed some of the level goals of making matches with all gems that have pearls on them, or collecting all Playing Cards for example. It's an older Match 3 game, and the graphics aren't all that great, but it's still a fun and addictive game, enjoy! Rated 4 out of 5 by verimeri from harder than it looks It's a fun game but it is a lot harder, and therefore more frustrating, than it would seem. Some rounds have taken me 20 min. ( hint- play untimed) . I do very much like the hidden object levels and the rebuilding of temples. If you are seriously into playing and don't mind putting in some time to solve a level you will enjoy this. If you are just looking for relaxing fun this may not be the game for you. Rated 4 out of 5 by nelliebj from Fun Game I really like the different types of M3 games. Some really easy, some more difficult (and frustrating LOL). Plus a few HOG s thrown in it's a pretty good game. As each segment progresses the games get a little more difficult but still, pretty easy to finish. You have the option of timed or untimed which I really like. No pressure!! I have no idea at this time how long the game is but as I'm still building, I keep going. I love games where you get to build something or make a garden, farm etc. This is one of those. Prince Theseus has been captured by cruel Amazons and it’s up to you to help Ariadne on her dangerous and exciting journey!